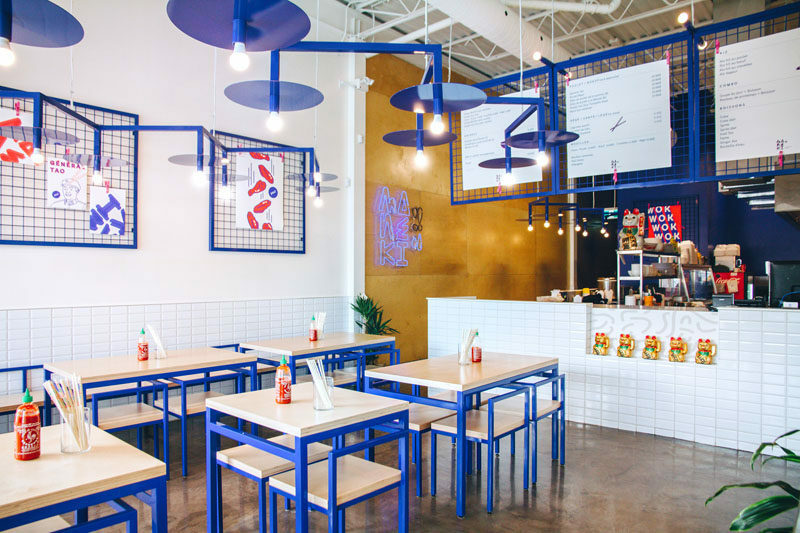 Rainville-Sangaré has collaborated with Studio Beau to design the recently launched Maneki Comptoir Asiat’, a new Asian restaurant in Montreal, Canada. The designers aimed to create a space that was fun and inviting, while playing with elements of Asian pop culture. A custom made, blue zig-zag light fixture hangs in the middle of the restaurant tying together the overall look of the furniture and decor. White subway tiles partially cover the walls, while blue metal grid frames with graphic artwork, adds a unique decor element that can be easily changed out. Made from plywood and blue metal frames, the furniture is kept simple and sturdy, with the food and conversation meant to be the focal point. A bright purple neon light of the restaurant’s name ‘maneki’ is hung on the wood wall to the left of the service counter. The name ‘maneki‘ has been borrowed from the famous fortune cat figurine that is popular in both Chinese and Japanese culture. 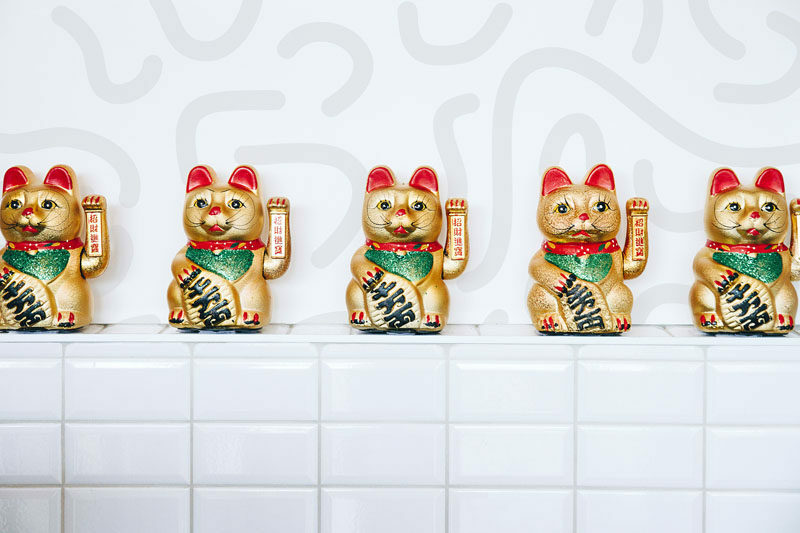 Sticking true to the name of the restaurant, mini maneki-neko fortune cat figurines are displayed on a built-in shelf on the front of the white tiled service counter. 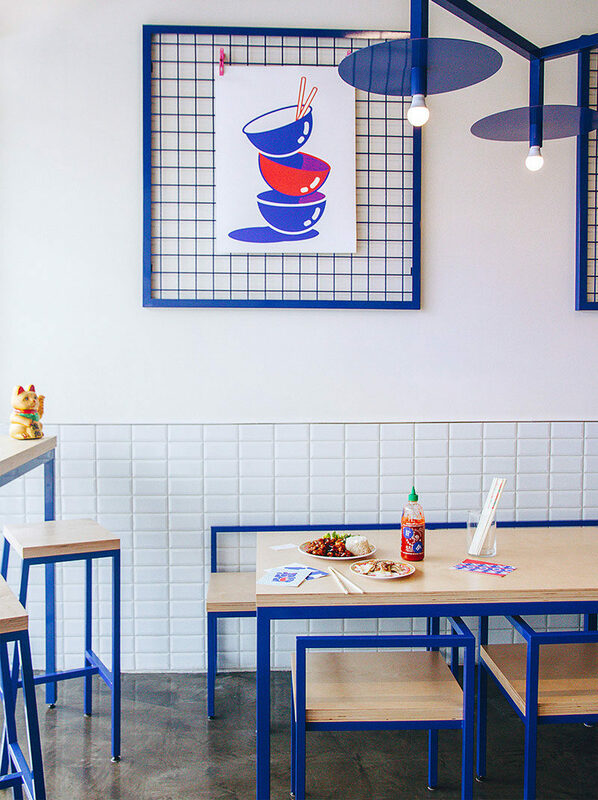 Sprinkled throughout the restaurant are various pop art prints in a limited blue, white, and red color palette featuring famous Asian icons, songs, and food dishes.